Young star Andrew Luck and the Indianapolis Colts will kick off Week 6 against the Houston Texans on “Thursday Night Football”. A number of interesting games fill the NFL Pick Em Week 6 sheet. The printable sheet is available for free on this page. AFC South rivals will get things started in Week 6 as the Colts clash with the Texans in Houston. Luck led the Colts to the division title and a Wild Card win over the Chiefs in his second NFL season. The Texans ended 2013 with 14 consecutive losses to finish the year an NFL-worst 2-14. 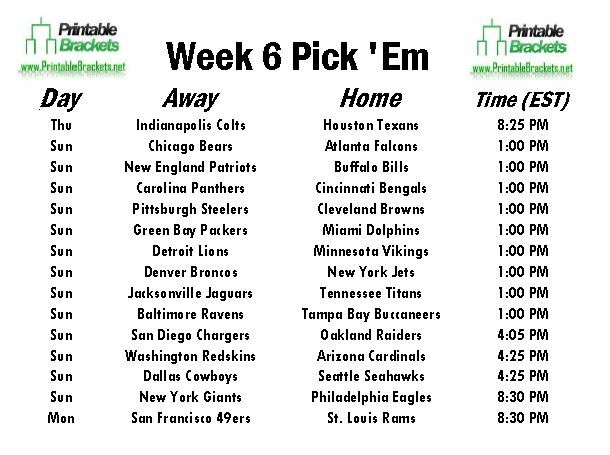 There are nine early games on the NFL pick em Week 6 sheet. Peyton Manning and the Denver Broncos will travel to the Meadowlands for the first time since losing Super Bowl XLVIII to take on the New York Jets. New Jets wide receiver Eric Decker will also be facing his former team for the first time since leaving Denver as a free agent in the offseason. Also in early action on Sunday, the Cleveland Browns will host the Pittsburgh Steelers, while the Buffalo Bills will battle the New England Patriots. Late Sunday action on the NFL pick em Week 6 sheet is headlined by a meeting between the Cowboys and Seahawks in Seattle.The San Diego Chargers and Oakland Raiders will also renew their rivalry Sunday afternoon. The day’s action wraps up with Nick Foles and the Philadelphia Eagles hosting Eli Manning and the New York Giants on “Sunday Night Football”. The final game on the NFL Pick Em Week 6 sheet features the St. Louis Rams hosting the San Francisco 49ers on “Monday Night Football”. Only two teams have a bye in Week 6. The Kansas City Chiefs and the New Orleans Saints have the week off.